I don't know about you, but I find myself getting overwhelmed by the amount of makeup I have available to me when it comes time to put my face on in the morning. As someone who is fairly indecisive I find that it will take me ages to just pick out what look I want or what products to use. So I started making a selection of all the products I needed to create a single look. 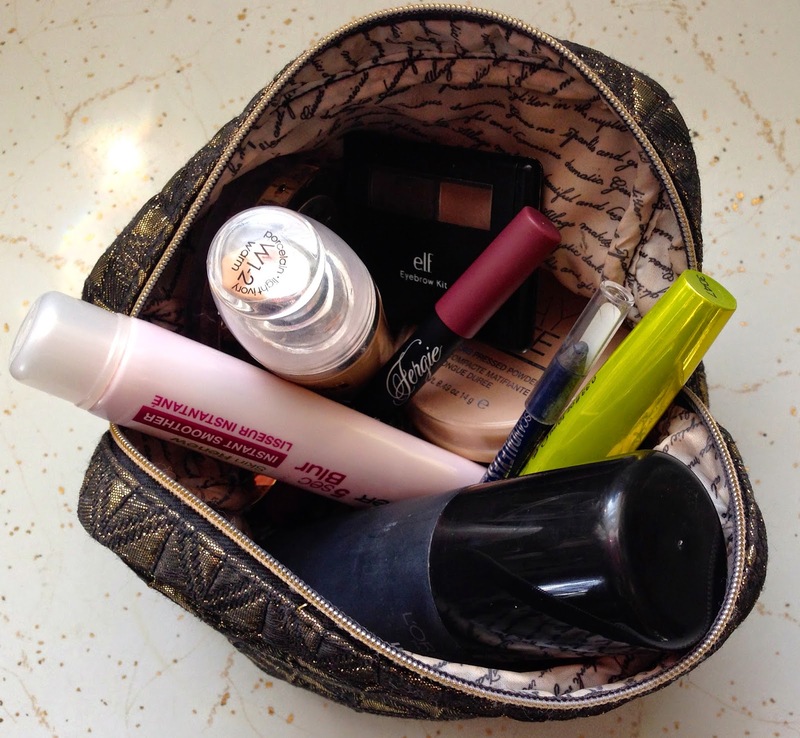 I put all of those items in my makeup bag and just use those products for the week. Now I have only been doing this for the month of January, but it has already helped cut down on the amount of time it takes me to get ready and it is also helping me to incorporate some products that don't get as much consistent use. Eyes // My go to combination for a quick eye look includes three shadows. Milani Belle Eyes Gel Eyeshadows in Bella Cappuccino, Bella Sand, and Wet n Wild Color Icon Single in Nutty. On my brows I use the ELF Eyebrow Kit in Medium. This is a wonderful due for a quick eyebrow look that lasts all day. As much as I love my black kohl eyeliner, Rimmel ScandalEyes Kohl Eyeliner in Deep Blue has been having a real moment for me. Keeping with Rimmel I have also been using the Rimmel Lash Accelerator Endless Mascara in Black. Face // For my base I use the Garnier 5 Second Blur as a primer. This is a great primer that has a generous amount of product for the price. It smoothes the skin perfectly for foundation but isn't overly silicone and slippery. L'oreal True Match Lumi in Porcelain (W1-2) has been the perfect foundation for all of this cold weather. Generally I stick to quite matte foundations, but the Lumi has my interest peaked as far as radiant products go. My go to concealer is the Maybelline Fit Me Concealer in Light. The Milani Rose Powder Blush in Romantic Rose is a gorgeous mauve that I have been using all winter. And to set and finish my look I use Rimmel Stay Matte powder and L'oreal Infallible Makeup Extender. I have been very impressed with this drugstore setting spray! Lips // I have been testing out the Wet n Wild Fergie Velvet Matte Lip Color in Plumgenue. After looking for these at several different locations I realized that they are exclusive to Walgreens. It seems people have mixed reviews on this product so once I give it a little better of trial I will write a quick review concerning them. 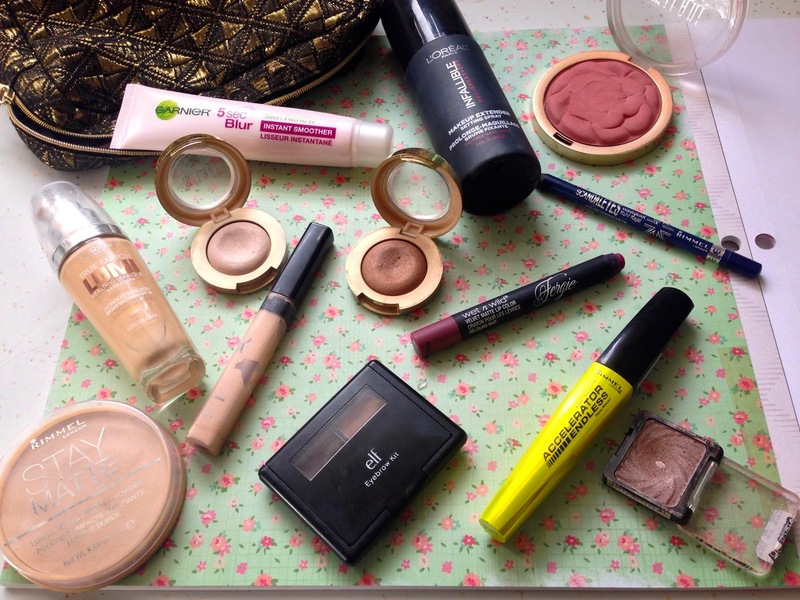 I hope you enjoyed a little look into my makeup bag for the week. 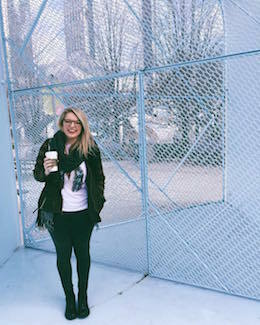 I love seeing what other people wear on a daily basis. Though I like to mix it up and experiment with my look I have a real hankering to find a signature makeup look so I hope trying these different looks weekly will help me achieve that! Do you have one makeup product that you just can't achieve your look without? Let me know!